I actually haven’t made too many recipes using quinoa (adding a note to that ‘to do’ list I love to make), but I can tell you this one is a winner! I would probably even consider entering it in a chili cook-off if I ever found myself writing my name on a sign up sheet for some reason! I promise this Quinoa version would proudly stand right up there with all the other meat chilis. It’s every bit as filling and tasty. For you meat lovers who just can’t go the vegetarian route I’d suggest trying venison or ground turkey to switch things up a bit and keep a good source of lean protein! Did you put your nose up at the suggestion of venison? If you’ve never tried it, I completely understand. I was the same way before I started dating my (now) husband who talked me into trying deer meat. The things you do when you’re in love! Turns out though, it’s quite delicious! We use ground venison regularly in spaghetti sauce and substitute it in several other meals like casseroles, stuffed peppers and you guessed it, chili. If I didn’t talk you into giving it a try, we’ll stick with the completely satisfying quinoa version! Don’t forget to thoroughly rinse quinoa before using it! I suggest pouring the quinoa into a fine mesh strainer for this step. If you decide to cook this in the crock pot (who doesn’t love being greeted by dinner when you get home from work) I recommend still sauteing the garlic and veggies on the stove first for added flavor! 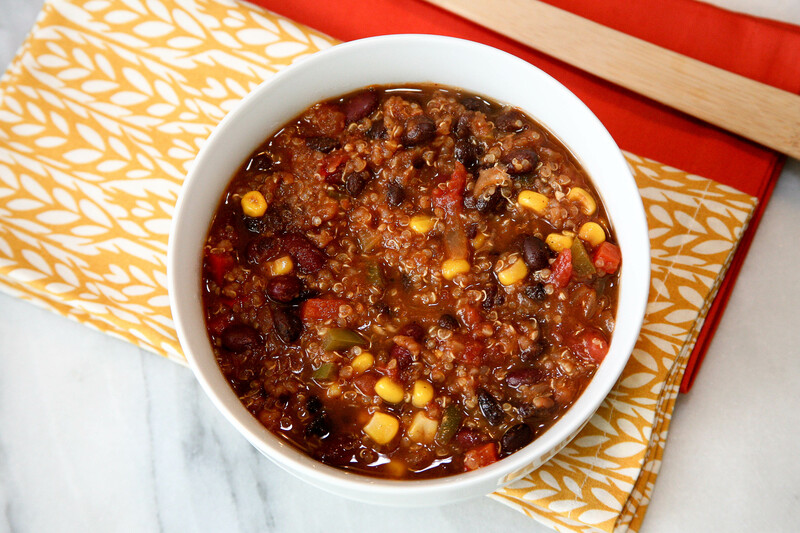 A vegetarian version of chili that will make you forget about meat! Prep your ingredients by slicing the onion, garlic & peppers and draining and rinsing the black & red beans. Heat olive oil in a large pot over medium heat. Add onion and garlic to saute for five minutes. Add peppers and all spices. Cook for another five minutes, stirring as needed. After five minutes, add remaining ingredients except the corn. Stir to mix all ingredients well and bring to a brief boil. Reduce heat to low and allow soup to simmer for at least thirty minutes. Add the corn and continue simmering for an additional ten minutes. Serve warm with your choice of bread or other side. This entry was posted in Dinner, Recipe Book and tagged chili, chili recipe, comfort food, fall soups, quinoa, quinoa chili, quinoa recipes, vegetarian chili recipe, vegetarian dish. Bookmark the permalink.